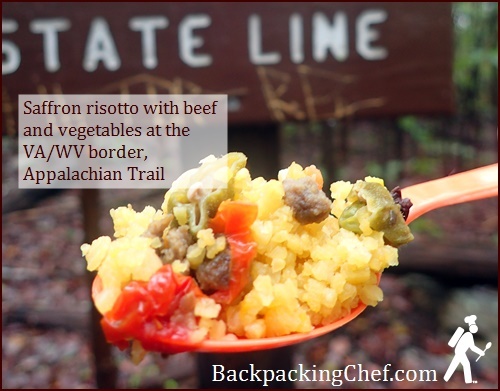 In last month’s newsletter, I left off at Bears Den Hostel after Day 5 of my hike to Harpers Ferry, West Virginia. The folks sitting in front of the glowing fireplace when I arrived at sundown were two steps ahead of me – well fed and clean. Bears Den has a $30 hiker special: shower, laundry, pizza, pint of ice cream, bunk, and pancake breakfast. Built in 1933 for a physician, the Appalachian Trail Conservancy purchased the rock mansion and sixty-six acres in 1984. The Potomac Appalachian Trail Club manages it. In the morning, Go Girl, one of the women I had met at Mountain Home Cabbin, flipped pancakes for all takers. Before leaving, I boiled water for my thermos lunch – saffron risotto with beef and vegetables. Cozy Bears Den was hard to leave with fog and drizzle looming outside. Several thru-hikers had just popped in a video of Blazing Saddles when I left at 10:30. I reached the VA-WV state line after two miles and ate my thermos lunch in front of the sign. It was more than I could eat, so I screwed the cap back on and finished eating it two hours later – still nice and hot. From the cliffs at Raven Rocks, I looked down over green treetops spanning a narrow gap which curved back up an adjacent ridge. Mist drifted thickly overhead and dripped from needles of pines growing in the sandy soil along the precipice. 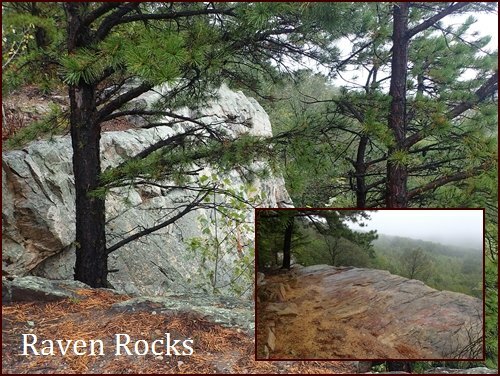 Dew intensified the red in the rocks and turned the pine bark dark brown. The scent of minerals and soil percolated up. Decomposing tree trunks exuded a crumbly-wood and moss aroma not noticed on sunny days. I kneeled at the hollow end of one such log and engaged a chipmunk who kept sticking her head out to see if I had moved on. While I waited, she slipped out the back door and ran across the trail. 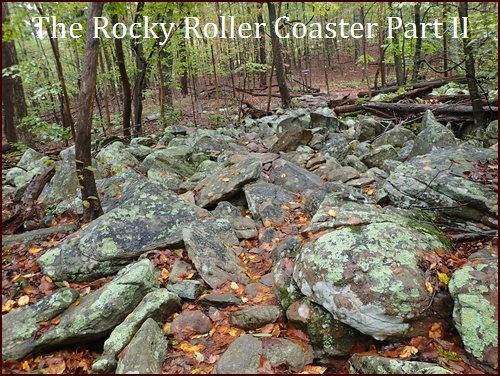 The ups and downs of the last three miles of the roller coaster weren‘t as difficult as the rocky path itself. A lot of the rocks had veins of white quartz running through them. The trail wasn’t all rocks, there were some smooth segments, too. At the eight-mile mark for the day, I hiked down the steep side trail to Blackburn AT Center. Trail Boss, the on-site caretaker, appeared while I was topping off my water supply from the spigot. The 13-mile roller coaster section of trail was his pride and joy – he built it and looks after it with a crew of dedicated trail maintainers. Trail Boss said he had something I might be interested in. He went to the kitchen and returned with a donut. 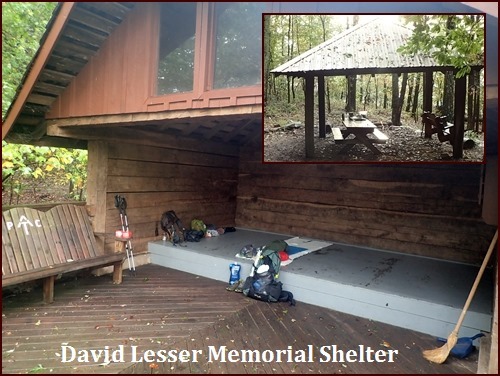 There is a separate hut with eight bunks and a wood burning stove for hikers. The main building, a beautifully restored log cabin with wraparound porch, is used to host and feed trail maintainers. Since it was late in the day, with three miles to go, I boiled water to make supper – shrimp linguine – in the thermos. It would be ready-to-eat when I got to David Lesser Memorial Shelter. 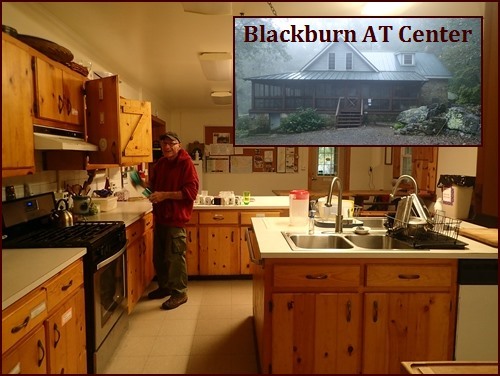 Trail Boss in the kitchen at Blackburn AT Center. It was almost dark when I reached the shelter. I shared it with three young women. Two were out for a week, and the other was part of a group of friends tenting further down from the shelter. After rolling out my sleeping bag and getting settled, I ate my shrimp linguine from the thermos while sitting at the edge of the shelter with my headlamp on. I did not need to hike a quarter-mile to the spring in the dark since I had tanked up at Blackburn AT Center. In the morning, I cooked cinnamon-spiced rice pudding with apples and raisins at the picnic table under the pavilion next to the shelter. The fog brightened in front of the sun – a hopeful sign that blue sky might prevail. 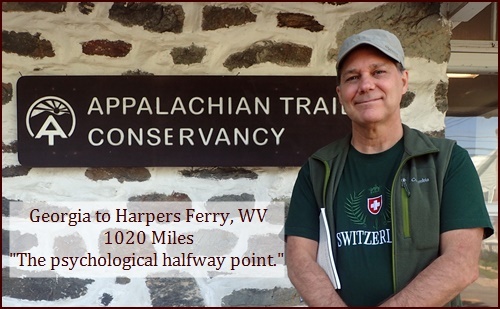 Most of the nine miles to Harpers Ferry were level or gently descending along or near the top of ridges. Like the previous day, I ate my thermos lunch – mashed sweet potatoes with beef and vegetables – in two stops. 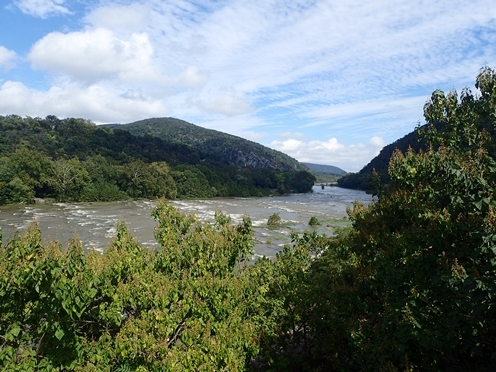 The sky turned blue for the last two miles of woods through Harpers Ferry National Historic Park. I slipped several times descending the last steep mile to the Shenandoah River. The trail was slick with wet rocks and loose dirt. I walked the Hwy 340 Bridge over the river and proceeded down Shenandoah Street along the Shenandoah Canal and past the ruins of a former pulp mill. A little further along, I boarded a bus which took me to my car at the park’s visitor center. I stayed at the EconoLodge because my reservation at Lily Garden B & B was for the next night. Finishing the hike in seven days instead of the planned eight days gave me the opportunity to spend the whole next day exploring Harpers Ferry. In the morning, I walked from the hotel back to Shenandoah Street to hike a short stretch of trail above town through the woods that I had missed. After chatting with three deer, I passed the historic Lockwood House, Harper Cemetery, Jefferson Rock, and the ruins of St. John’s Episcopal Church. Thomas Jefferson had sat on the rock which bears his name in 1783. He described the scene looking down over the Shenandoah River as it approaches the Potomac as, “worth a voyage across the Atlantic.” Sandstone supports were added in 1860 because the rock had become wobbly from heavy use and erosion. 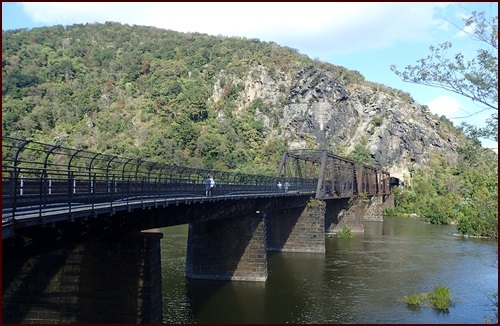 Emerging from the woods, I walked through historic lower Harpers Ferry and then over the Potomac River by way of the railroad bridge to touch Maryland soil. View from “The Point” in Harpers Ferry across the Potomac River and Railroad Bridge to Maryland. While in Harpers Ferry, I visited all of the museums which tell the fascinating history of the town. Before there was a bridge, or even a town, a ferry service across the Potomac was established in 1733. 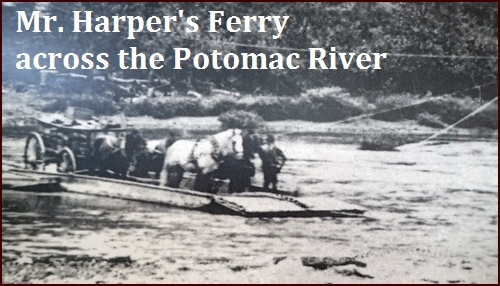 The ferry was purchased by Mr. Harper in 1747. Robert Harper, the town’s founder, saw the area’s great potential for industry: water power from two mighty rivers, abundant natural resources, and transportation through the gap by way of the rivers and canals, and later the railroad. George Washington, a Virginian and first President of the United States, recommended Harpers Ferry as the site of the nation’s second armory in 1796. John Hall’s Rifle Works, located on Virginius Island along the Shenandoah, was the first enterprise to perfect the use of machine-produced interchangeable parts on an industrial scale – ushering in the Industrial Revolution. Previously, gun parts were made one at a time by skilled craftsmen. Meriwether Lewis stocked up on supplies and rifles here in 1803 before embarking on his famous westward expedition with William Clark. The engine house was located next to the armory to suppress fire or explosions. It survived the Civil War and has been rebuilt exactly as it looked back then, close to its original location. In 1859, John Brown, the steely-eyed slavery abolitionist, led twenty-one men in a raid on the armory with the goal of inciting and arming a slave revolt. He and several of his men briefly captured the armory, but were soon cornered in the engine house by local citizens and militia. 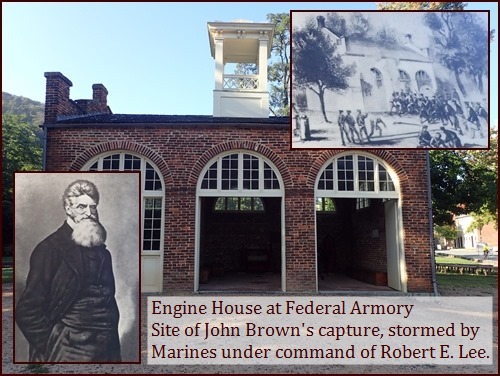 Refusing the offer of surrender, a contingent of Marines under the command of Lieutenant Colonel Robert E. Lee stormed the engine house and captured or killed the raiders inside. John Brown was charged with treason and hanged. In 1861, Virginia seceded from the Union and the nation began its Civil War. West Virginia was not a state at the time, but was carved out of Virginia territory and admitted to the Union during the war. Harpers Ferry changed hands between Confederate and Union forces eight times during the war, devastating lives and property. Today, Harpers Ferry, under the care of its active citizenry and the National Park Service, thrives again as a repository of the nation’s history, as well as a hub for hiking, paddling, and fishing. There are numerous restaurants tucked into historic buildings and several Bed & Breakfast options. I enjoyed two pleasant nights at the Lily Garden Bed & Breakfast. They offer private and cozy accommodations for between one and six people. Harpers Ferry has inexpensive train service to Washington, D.C. for further exploration. I visited the Appalachian Trail Conservancy headquarters while in town. A lounge in the back provides soda and coffee for hikers. I renewed my ATC membership and purchased a beautiful coffee table book with a great narrative about the trail‘s history, The Appalachian Trail: Celebrating America’s Hiking Trail, by the ATC’s publisher, Brian King. I have now hiked all 1,020 miles of the trail through the southern states. It feels good to have reached the “psychological halfway point” between Springer and Katahdin. I walked most of it alone, but was never more than a whisper away from the many souls who give their time and love to the trail: the builders, the maintainers, the protectors, the angels, and fellow hikers. Thank you. You have enriched my life. One of the joys of hiking the Appalachian Trail has been the hundreds of conversations I have had with people along the way – ordinary people, each with a story to tell. One of those chance conversations, on a foggy mountaintop, led me, in a most mysterious way, to Dominique in Switzerland. I didn’t see that coming when I set out in 2009, but then the Appalachian Trail is full of surprises. See you next month. Happy Trails!